Kindergarten students recognize basic facts and concepts about their bodies and begin to acquire skills and practices that keep them safe and healthy. Students learn to seek help and advice from parents/guardians and other trusted adults and begin to learn how to seek reliable health information. They understand how to make good decisions about simple health issues, respect others, follow school safety rules, and be responsible. Have students color in a paper plate using the recommended proportions of food groups. Ask students to identify various foods that belong to each food group and encourage them to eat a variety of foods from all food groups. Explain why breakfast is important and give your students paper plates and stickers that represent various foods and have them create a healthy breakfast plate consistent with the groupings on myplate.gov; students can also create healthy lunch and dinner plates. Create a mobile or poster of the five healthy food groups and ask students to identify them (bread, cereal, rice, and pasta group; fruit group; vegetable group; meat, poultry, fish, dry beans, eggs, and nuts group; and milk, yogurt, and cheese group). Talk to students about why they should eat foods from each food group (different foods give your body energy to move, think, and grow). Have students call out some of the food products they have seen advertised on television or on billboards; discuss how some of the food products advertised and sold are unhealthy and encourage them to eat five fruits or vegetables a day. Have a conversation with students about the benefits of physical activity and exercise (e.g., to exercise muscles, help blood flow to brain to help them think clearly, and to build a strong heart). Have students name different types of physical activity and specific exercises to build heart fitness (walking, running, jumping rope, swimming, hiking, playing basketball and soccer). Prepare a worksheet for students. Ask them to circle activities that are good for heart fitness. Have students talk about what they did from the time they woke up to the time they arrived at school that morning; list the different types of physical activity that they engaged in during that time. Have students talk about recess and the different types of physical activity they engage in during recess. Have students identify after-school physical activity opportunities. Have students engage in “Energizers“ - brief in-class physical activity exercises- during this unit and throughout the year (http://www.ecu.edu/cs-hhp/exss/upload/Energizers_for_Grades_K_2.pdf. Remind them that movement exercises keep the muscles, heart, and brain strong. Talk about the importance of limiting screen-time; go around in a circle and have students call out other activities that are as fun or more fun than watching TV. Discuss the importance of sleep as a way of resting the muscles, body, and brain after a busy day. Ask students the following questions: Why is sleep so important? How much sleep do you get every night? How do you feel when you don’t get enough sleep? What helps you fall asleep? What are dreams? What kind of dreams have you had? Suggest ways to calm down before sleep; give students a coloring sheet related to bedtime; have students add the things that helps them calm down before sleep through writing or drawing. Describe grooming – personal hygiene practices (tooth brushing, flossing, hand washing, shampooing and cleaning up) as ways to take care of body and appearance. Describe how germs (bacteria, viruses) are tiny, invisible organisms that may cause common illnesses (cold, flu) but that we can stop their spread by washing our hands often. Hand washing removes these bacteria and viruses. Have students call out situations where it is important to wash hands. Show a video such as: How to Brush Your Teeth Properly - For Kids https://youtu.be/hDZXSMU2lAkto demonstrate how to brush and floss correctly; have students practice in class with clean toothbrushes and water (no toothpaste). Unit 3 - Grade K - What is an Emergency? Have students define safety rules; post and discuss their class and school safety rules (no running, putting books away, fire drills etc.) and how each specific rule keeps them safe. Ask them to identify some of the safety rules they have at home (e.g., putting toys away, not touching poisons) and describe how these keep them safe. Talk to them about safety rules for bad weather (e.g., get inside quickly, follow adult instructions), sun safety for hot weather. Ask them to describe how these keep them safe. pedestrian safety (e.g., walk on the sidewalks, cross at the corners). motor vehicle safety - (e.g., lock door, wear a seat belt or safety seat, stay seated). Show students various images of walking, riding in a car or bus, or bicycling and have them identify the safe choice. Use a visual graphic checklist and have students identify appropriate and inappropriate behaviors for the situations. Show students various safety signs, warning labels, and symbols and have them identify their meanings. Medicines have poisoning and warning labels. 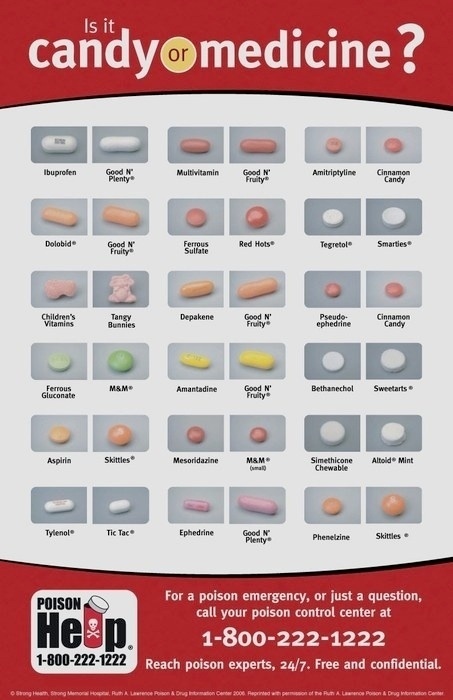 Have students identify these labels on sample images and promise to tell adults if they ever see another child taking medicine without an adult. Send poison control stickers home with the students. Have a discussion about the people who can help in an emergency, dangerous, or frightening situation and have students identify family members, adults at school, health care professionals, and public safety figures (police, ambulance, fire) as helpers. Have students describe why it is important to ask adults for help in emergencies and how to ask for help. Give students stickers of various community and public safety figures and worksheets that reflect various situations and have them affix the stickers of someone who can be helpful in each situation. Demonstrate calling 9-1-1 and have students practice calling 9-1-1. Unit 2 - Grade K - How Are You Feeling Today? Tell students that feelings or emotions are the way they feel inside. Have students describe feelings (e.g., happy, sad, mad/angry, scared). Provide props with smiley and frown faces and have them indicate how certain activities/events make them feel (e.g., getting ice cream, getting sick, having a birthday party). Have students practice using words to identify emotions. Have students create a poster with pictures of people, places, and things that make them feel happy, sad, angry or scared and identify the emotions. Read an age appropriate story about an event where characters feel anger, frustration, fear or sadness. Have students: describe appropriate ways to deal with uncomfortable feelings (e.g. one good way is to talk about them); describe inappropriate ways to deal with uncomfortable feelings (starting a fight, saying bad words, breaking something); and discuss healthy ways to deal with feelings. Have a discussion with students about what it means to be a friend and to show care and consideration for others. Have students identify why friends are important and ways that they cooperate and share with others. Have students identify their feelings (happiness) when friends cooperate and share. Have students role play strategies for making friends. Have students role play strategies for establishing social and physical barriers to include polite refusal skills, cooperation with others, and adaptation to change. Participating in a variety of movement experiences to develop fundamental movement patterns is the primary focus of the kindergarten physical education curriculum. While children at this level vary in maturity across all movement skills, they should demonstrate continuous improvement in movement under very simple conditions. While developing fundamental skill patterns, students begin to learn key movement concepts that help them perform in a variety of educational games, dances, and gymnastics. They learn how their bodies react to vigorous physical activity. Students learn to use safe practices, cooperate with and respect others, and follow classroom rules. Experiences in physical education help them develop a positive attitude for leading a healthy, active lifestyle.